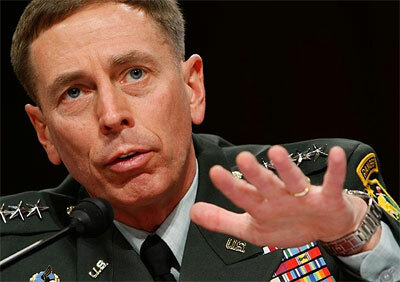 A not so secret directive penned by Gen. David H. Petraeus authorizes sending American Special Operations troops into Iran. The directive mentions a wide swath of countries in the Middle East, Central Asia and the Horn of Africa, but is obviously tailored for Iran, the number one target on the Pentagon’s radar. The New York Times reports that the “secretive” directive is designed to “penetrate, disrupt, defeat or destroy” al-CIA-duh and other militant groups, as well as to “prepare the environment” for future attacks by American or local military forces. It authorizes attacks outside of designated war zones and dispenses with informing Congress and the American people. In 2006, the journalist Seymour Hersh reported on U.S. “clandestine activities” (such as blowing up mosques) in Iran. “This White House believes that the only way to solve the problem is to change the power structure in Iran, and that means war,” a Pentagon adviser told Hersh. In 2008, Hersh talked about covert missions in Iran. Israel used “hitmen, sabotage, front companies and double agents” to disrupt the country, according to the Daily Telegraph. Earlier this month Hersh said the Pentagon has Obama on a short leash and his administration experienced a seamless transition from Bush and the neocons. In 2009, the new director of the United Nations’ the International Atomic Energy Agency said there is no evidence that Iran is using its legal nuclear energy program as a cover to develop nuclear weapons. “I don’t see any evidence in IAEA official documents about this,” Japan’s Yukiya Amano told Reuters. The IAEA has consistently said it cannot find evidence of an Iranian nuclear program. Former Bush speechwriter and neocon David Frum praised the efforts of Democrats to meddle in Iran’s business on Monday. “Impatient with White House inaction, Democrats in Congress are pressing ahead with their own plan for gasoline sanctions on Iran,” Frum wrote for the National Post. The U.S. has a long history of military intervention around the world. It has dispatched troops to Korea, China, Vietnam, Lebanon, Egypt, Laos, the Congo, the Dominican Republic, Cambodia, El Salvador, Grenada, Honduras, Iraq, Panama, Bolivia, Somalia, Bosnia-Herzegovina, and many other nations. See an exhaustive list here. The CIA’s operation TPAJAX in Iran deposed the democratically elected leader Mohammad Mossadeq in 1953. The “CIA extensively stage-managed the entire coup, not only carrying it out but also preparing the groundwork for it by subordinating various important Iranian political actors and using propaganda and other instruments to influence public opinion against Mossadeq,” writes Mark Gasiorowski.